Today’s path to purchase is more complex than ever before, with access to always-on media and connected devices offering unlimited opportunities for distraction. 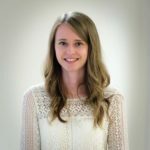 Online retailers have been using an array of techniques to close the loop in the purchase journey – including targeting consumers with recurring programmatic ads of items they have searched for, or emails about abandoned carts and exclusive deals – all with the hope of bringing consumers back and converting them. After all, a large number of consumers are being lost in the purchase journey: a bespoke study we ran in the U.S. and UK revealed that more than 75% had abandoned an online shopping cart in the last month. The endless quest to catch and convert online product researchers (83% of the online population) into actual buyers is clear. But which product categories hold the most potential here? And what can online retailers do to get consumers across the purchase line? Moving from showroom to webroom. Looking at the ratio of online researchers to online buyers across nearly 100 products reveals a lot about consumers’ shopping habits across different product categories. Where the ratio is above 1 – meaning there are more online researchers than online purchasers – the item in question is susceptible to webrooming, where consumers browse online before buying the product in a physical store. This is more likely to be the case for big-ticket items, like cars or vacations, where consumers can take advantage of in-person customer service, test products or feel reassured about their financial outlay. 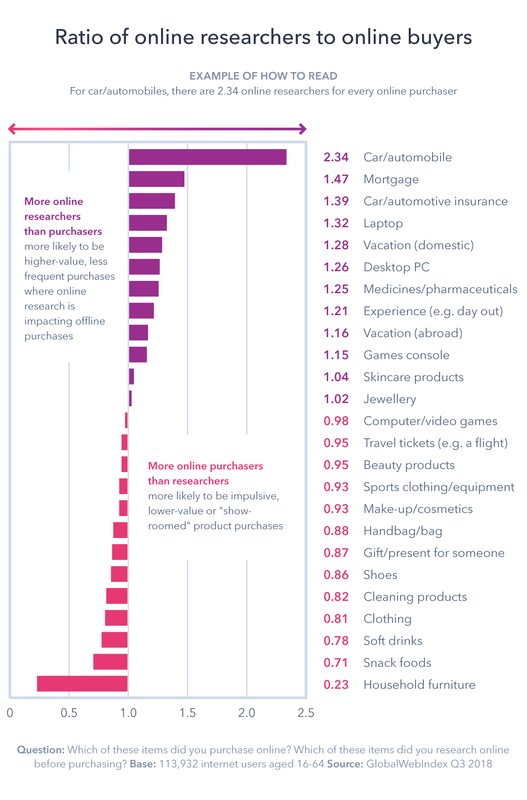 In contrast, other items have more online purchasers than online researchers (any with a ratio of under 1). Some of these products are simply too low in value to require online research, are habitually purchased or are bought because of available online deals. But for some items, like clothing or household furniture, an element of showrooming is likely taking place. This is where shopping begins in store to test products or sizes, and is completed online to take advantage of price comparisons across different retailers, exclusive online deals and the convenience of delivery. 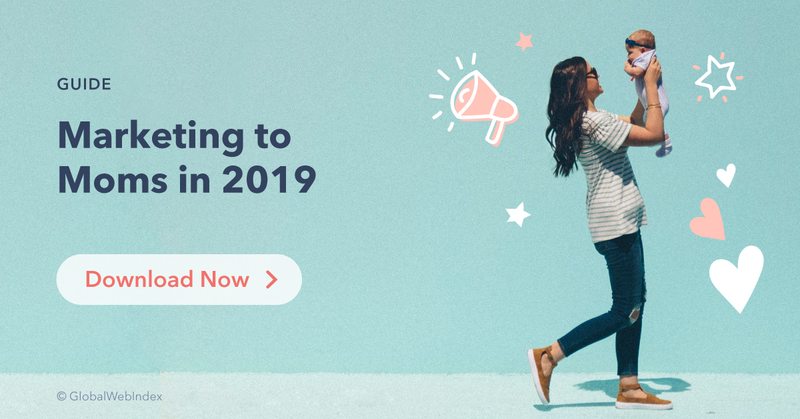 New technologies will continue to impact these trends throughout 2019. Chatbots and voice technologies are revolutionizing online customer service, reducing the need for consumers to divert offline for in-store interactions, while developments in augmented reality are letting customers try on styles or products from home. And some brands are already leading the way. L’Oreal has released a string of smartphone tools to let customers “try on” different hair or skin care products using their smartphone camera, and IKEA’s AR app, “Place”, lets anyone drop virtual furniture straight into their own living room. In 2019, weaving these emerging technologies into existing strategies will become increasingly important for retailers. Consumers will feel more comfortable about completing purchases online, and the online research experience will be improved, boosting purchase conversion rates. Highlighting what truly matters to online consumers. With so many online commerce platforms to choose from, it’s essential for sellers to meet expectations to position themselves, and their benefits, as the default in the path to purchase – especially as one-stop shop experiences offered by the likes of Amazon continue to dominate the space. This is even more important for brands with little high-street presence or online-only retailers, who are fighting against retail giants with a greater reach. However, our research shows convincing online researchers to make a purchase when they’re at the crux of deciding whether to convert or not is easier than it seems. The global impact of pricing immediately stands out. 6 in 10 internet users say free delivery makes them more likely to purchase something online – making it twice as important as next-day delivery. This trend is the same across all world regions, reaching just over 7 in 10 in North America, and the consumer demand for free, but rapid, delivery has set the precedent in the ecommerce market. Baby boomers are the most likely generation to be motivated by savings-focused offerings, but also lead the way for being influenced by the convenience factor – whether that’s an easy returns policy or an easy checkout process. This generation may have the highest ratio of researchers to buyers, but with almost 8 in 10 saying they researched an item online last month, the opportunity to close the purchase loop online is clear – they just need to be aware of the positives of online shopping. While millennials also favor free delivery, they are most ahead of the average for social commerce, emphasizing the need for brands to work on their social media strategy, with click-throughs to their website or products displayed on posts. And as millennials are the most socially impacted, being able to motivate followers to share their own opinions online will also contribute towards the shopping process, as our data shows likes and good comments do change consumer opinions. Meeting consumers at key touchpoints. The webrooming and showrooming trends only prove brick-and-mortar is still relevant, but as chatbot and AR technology continues to improve the digital shopping process, retailers need to stay ahead of the game with omni-channel experiences – and that extends beyond traditional thinking. As consumers become more “at home” with online shopping, truly understanding evolving consumer needs will make the difference for brands. It’ll help them be present at crucial touchpoints to meet consumers at key moments, on the right channels, with the best services.